This is a small appliqué pattern with lots of details and embellishment for a special time of the year. The pattern includes full (stand alone) patterns for all the critters and all the people in case you want to make your own arrangement. There are three camels, with blankets and saddles and bridles, a mule, two sheep, a cow, and seven figures including Baby Jesus in his manger, and the stable and four palm trees. I know everyone is scared to make people's faces, so I made that part easy. The face details are traced, using a light box or a window with sunlight shining through, with a thin permanent marker that you would use to make a quilt label. There are complete instructions for raw edge appliqué, and for making all the fun 3-D effects: the palm leaves and the beading for the star. 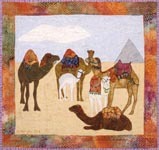 The quilt is 24" wide x 23" high. PDF-format patterns are NOT available to our wholesalers. Wholesalers need to order printed patterns instead.